"There is naught that you can do, other than to resist, with hope or without it. But you do not stand alone." A year ago this week a city died. Now cities, unlike people, can return to life; and there are signs that this will happen to New Orleans. But we must still mourn the dead. And we should remember that while it was the storm that struck the blow, it was our government that left it half-dead by the side of the road -- saw it and passed by on the other side; and it was our government that had so weakened its defenses that a storm could take it from us. For the dead: rest in peace. • Shakespeare's Sister has a post with a huge number of links; and another post here. • Publius thinks about how "In America, everyone is outraged for fifteen minutes." • Teresa Nielsen Hayden on what hasn't been done in the past year. • Frank Rich on Bush's return to the scene of his crime, and Paul Krugman on the broken promises of the past year. • Via Majikthise, Think Progress and Uggabugga both have Katrina timelines. By the end of part one I had gotten to the following question: given that the I Ching is useless for actually predicting the future, what value, if any, does it have? Well, the first answer is simple: it has literary value. Fire in the lake: the image of REVOLUTION. And makes the seasons clear. A striking image, without a doubt. Okay. So the book has had some literary uses. But is that it? Is there any more to it? Well, maybe. Yale law professor Jack M. Balkin, at least, argues that there is. Balkin's argument can be found in his 2002 book The Laws of Change: I Ching and the Philosophy of Life. First off, props to Professor Balkin for writing something so far outside of his field of expertise: I am against intellectual tunneling, in general, and find it refreshing when people produce uncharacteristic works. Interestingly, it also got good reviews from serious I Ching users, which is pretty impressive. 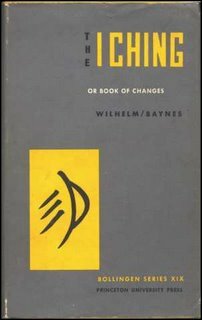 Balkin's book is a hundred-page introduction to the I Ching -- its history, its philosophy, its use -- followed by a translation and commentary. The I Ching does not predict the future. All it does is give you something to chew on, stimulate your unconscious mind. There is absolutely no evidence that randomly throwing coins predicts future events. But reading selected passages from the book itself is quite good at shaking up your accustomed patterns of thought. And sometimes it can be eerily on point, in part because the reader brings his or her own unconscious thoughts and desires to the reading of a text that is by nature ambiguous and subject to multiple interpretations. This -- as I trust will be clear -- is a perfectly reality-based argument for the I Ching's use. There's no mysticism here: just a sense that, when one is stuck, picking up a random text can "stimulate your unconscious mind" and "shak[e] up your accustomed patterns of thought." Okay. But why the I Ching then? Why not open any book randomly? What is truly important is the underlying philosophy of the book. By formulating specific questions, contemplating the answers, and applying the book's principles and metaphors to their own situation, people who use the Book of Changes are gradually introduced to its characteristic philosophy of life in concrete contexts. Precisely because the book is structured not as a treatise but as an oracle, its philosophy is revealed not through memorizing a specific set of abstract doctrines, but through application and problem solving. In this way people assimilate over time an intuitive understanding of the book's approach and its distinctive take on the laws of change. In other words, the reason to consult the I Ching rather than simply pick up a random text is its quality as a text -- not simply its literary quality, but its philosophical quality. This is not quite "philosophy" in the contemporary academic sense (which he describes in a truly bizarre way -- do any philosophers " memoriz[e[ a specific set of abstract doctrines"?) -- in fact, it is more like the common popular use, the one invoked when people talk about a 'philosophy of life'. It is a set of principles towards the problems of living a life -- principles best absorbed, Balkin says, in concrete situations. Is the text as good as Balkin claims? I don't know. Or, perhaps I should say: I don't know yet. Because I must admit I am intrigued. Unlike the fortune-telling use, this description of a possible use is perfectly plausible: one can imagine a handbook of maxims for life that, over time, guides and shapes one's outlook in a positive direction. I don't know it much better than the I Ching, but my sense is that the Meditations of Marcus Aurelius is one such book. There's no reason that the I Ching couldn't be another. Thus I think that the scorn that the Raving Atheist (who, it should be remembered, is quite raving, and seemingly less atheist than he used to be) had for Balkin was unwarranted. RA pooh-poohed Balkin's disclaimer about not predicting the future -- unfairly, I think: I take Balkin at his word -- and certainly does not offer any answer to the notion that a particular text might in fact be a useful stimulus for thought and decisions. The Mouse dared half the distance of the rug. "You're really going to try and tell the future with cards? That's silly. That's superstitious!" "No, it's not, Mouse, Katin countered... "Mouse, the cards don't actually predict anything. they simply propagate an educated commentary on present situations--"
"Cards aren't educated! They're metal and plastic. They don't know--"
"Mouse, the seventy-eight cards of the Tarot present symbols and mythological images that have recurred and reverberated through forty-five centuries of human history. Someone who understands these symbols can construct a dialog about a given situation. There's nothing superstitious about it. The Book of Changes, even Chaldean Astrology only become superstitious when they are abused, employed to direct rather than guide and suggest." The Mouse made that sound again. This isn't precisely what Balkin is saying, but it's certainly in the same ballpark: an attempt to understand fortunetelling devices in a non-superstitious way. I would be extremely skeptical about the idea that astrology can do this, and fairly skeptical about Tarot -- but Balkin has talked me into the idea that, maybe, the I Ching has something to say even for those who believe that it doesn't "actually predict anything "
The first reason boils down to tradition. The second could be misread as approving of a mystical approach, but I don't think that that is what Balkin means: he says that people prefer "a more mystical approach in which the book appears to speak directly to them". In other words, for the I Ching to do what Balkin claims it can -- shape one's philosophy of life through encounters with it in specific situations -- one has to take it seriously as a text: the appearance of mystical connection helps one take the text seriously, to truly open one's mind to whatever unconscious stimulation it has to offer. In other words, the appearance of the mystical helps us get at what is real -- wisdom, if the book has to offer it. Okay. But is the text that good? Is it really worthwhile? Only one way to find out. I've purchased a copy of Balkin's book, and intend to ask it questions when the occasion arises, and see what I think. I've already asked it one question -- no, I won't tell you, it's private -- and it's advice was, I suppose, good. So we'll see. There is, of course, a danger to doing this -- a danger, that is, apart from wasting a little time (which is easily compensated for by the fact that it's kind of fun, in a parlor-games way -- and no harm in that). The danger is that one might find oneself -- perhaps unconsciously -- taking the book seriously as prophecy. That the book can tell the future is, as previously mentioned, a totally nonsense notion. But the human mind has a tendency to be overawed by (imagined and imposed) connections -- there's a reason why psychics' random mumblings seem prescient -- and one might find oneself thinking that it actually all means something. When, of course, it doesn't. This isn't to say that the advice the I Ching offers mightn't be good advice -- of course it might, just as Marcus Aurelius's Meditations do. From what I've seen thus far, it's a sensible, balance-and-moderation-is-key Confucian* approach to life. It's just that one shouldn't get too hung up on the idea that the particular hexagram(s) one tossed are particularly meaningful for that situation -- since they could just as easily have been any others. Still, while I certainly think I could be hoodwinked -- I try to be rational, reasonable and reality-based, but people are weak and I'm no exception -- I think I'm aware enough of the dangers here to risk it. Though come to think of it, there's a second danger, too. My immediate assumption is that anyone who takes astrology, Tarot or I Ching seriously is a flake, an idiot, someone not worth taking seriously. And that's probably largely true... since normally what 'taking such things seriously' means is to believe in their mystical powers -- which is, once again, sheer nonsense. Now, I think that the argument in this post (Balkin's argument, basically, that I've summarized) is a good one -- that there are some ways of taking (at least) the I Ching seriously which are not necessarily stupid: that, basically, even if it clearly can't predict anything, it might still be a text worth reading. Nevertheless, people of sense have a knee-jerk reaction against such things -- and reasonably so, since they are largely used for silly purposes, or in silly ways. (I presume that this is what was going on with the Raving Atheist, for instance.) I bet that the moment most people read "I Ching" they'll think "bozo" without even pausing to hear the nuances -- or rebutting the argument. Oh well, maybe I just won't tell anyone. It's not like I've posted an essay about it on a public blog or anything. Besides, it seems that one ought to have the courage of one's convictions, even in the face of ridicule. (Balkin, for instance, did quite well at this.) I'm not particularly courageous -- nor am I particularly convinced. But perhaps I'll try anyway. Incidentally, if anyone else is interested, Balkin's book seems to be a good place to start. The review I linked to above says that Balkin's book is "a good choice for anyone who is beginning to get into the I Ching". 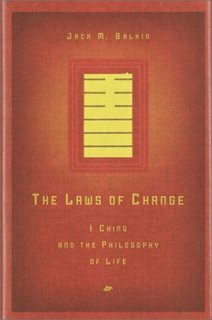 Another review on an I Ching site says that "I can't think of any other published book with so much I Ching information in one place," and that while "some of the commentary will sound very familiar: there are parts that are basically just rephrased and elaborated from Wilhelm/Baynes. But... [T]here's also considerable use of modern scholarship (though nothing radical) - and then there's Balkin's own insight." So the reviewers like it. Of course, they all note that Balkin doesn't take the fortune-telling aspect seriously -- but, for me, that is a feature not a bug. If you're interested in buying Balkin's book, it was published by Shocken Books, and it is ISBN: 080524199X. It was originally published for the exorbitant price of $32.50, but now there seem to be a bunch of copies floating around for $5 - $6, and you may even find one a dollar or two cheaper. Try the various used book aggregators I recommended here. This is the image of Revolution. To illuminate in accordance with the times. -- Largely the same, but a key change in the last line. To be continued -- maybe. * I'd be far more worried that I was misapplying my ignorant sense of what Confucius actually said -- I've never read him -- if I hadn't learned from Balkin's introduction that the classic commentaries on the I Ching (parts of which are translated along with the base text -- sort of like the Gemara to the Mishna,** I think -- and which shape all subsequent interpretations of it) were, for many centuries, actually attributed to Confucius; and, while this is apparently no longer believed, they were in fact written by various Confucian disciples. When I was a kid, my parents used to play the I Ching once a year. I say "play" because that's the term they used. But the I Ching isn't a game; it's an oracle. For those of you unfamiliar with it, the I Ching is an ancient Chinese text. Its name translates as The Book of Changes. (The familiar English form, incidentally, is the old, Wade-Giles system of transliteration (the one that brought you "Mao Tse-Tung"); in the currently-fashionable Pinyin system (the one that brought you "Mao Zedong"), the book's name would be "Yi Jing".) It's an ancient text -- the oldest part is from approximately 800 B.C.E. -- which one uses by asking a question, and then making a casting -- tossing yarrow sticks, throwing coins, or the like. My parents, as I said, did this once a year: on New Year's Eve. They had a particular old friend who would come over, and the three of them would drink champagne and ask the I Ching about the upcoming year. Now, they didn't take it seriously. I think they said that they "played" the I Ching because they thought of it sort of as a game: a fun thing to do that sparked the usual New Year's old-year-out-new-year-in sort of thinking, but nothing that was, you know, real. Certainly they didn't take it seriously as prophecy. As my parents consulted the I Ching, my sister and I would play -- allowed, on this one night, to stay up until midnight, a rare treat -- and then come down just before midnight to toast in the New Year with ginger ale. Then, one year I asked if I could play the I Ching with them. They said no. I'm not sure why. Possibly it was because they were drinking -- but of course they often drank wine with dinner when we were around, and it's not like they were getting rip-roaring drunk. Most likely it was because this was one of the few times each year they got to see this particular old friend, and they wanted to have a conversation with her; if my sister and I had joined them, it would have been a distraction. Those are, as I said, just guesses. But of course at the time I asked why not? What they said at the time was, "You're not old enough to play the I Ching." I was, predictably, furious. I stormed off to my room where I decided that I could make up my own fortune-telling mechanism. My parents used the method of tossing coins, so I did too; but I didn't know how it was done, so I approached it in its simplest form, as a branching tree: the first toss would go in direction A or B; if the former, then you'd toss again to decide between A1 and A2, and if the latter then between B1 and B2; and so forth. I didn't get very far: it wasn't much fun making the chart up, it was hard to think up enough fortunes, and of course I soon enough calmed down and went on to something else. It was from this incident that I got the idea that the I Ching was somehow an adult book -- filled with some mysterious wisdom that would corrupt the mind of a mere youth. So of course the first chance I got I pounced on it and read a few entries. From this point of view, it was decidedly disappointing. It was no more "adult" than your average fortune cookie, if possibly a bit more interesting. I didn't see what the big deal was (and, indeed, I still don't, which is why I presume that the reason my parents gave was a pretext for something else). And, eventually, when I was seventeen, I was finally deemed old enough to play the I Ching with them. I was delighted to be able to do it at last, but like many forbidden things, violating the stricture was the only exiting part. It seemed, otherwise, dull, even a bit silly. I had been right all along, I decided: my private little fortune-telling game had been just as good as the I Ching. Was I right? Was my little game just as good as the I Ching? Insofar as fortune telling was concerned, of course it was: they were (and are) both absolutely useless. Fortune telling by the I Ching is just as silly as astrology or fortune cookies or reading entrails. It doesn't -- it can't possibly -- work at all. That's why my parents treated it, properly, as a game. Which was precisely what my little homemade version was too. But -- and this is the "no" part of the answer -- my little homemade version was, not surprisingly, not as good a game. My method for picking fortunes was far less elegant and aesthetic. And, most importantly, the fortunes themselves were far poorer: instead of poetic little enigmas -- good for application to many situations (as any long-standing oracle would have to be) -- I had, as I recall, single words that seemed vaguely prophetic. Not nearly as fun to get. Even fortune-cookie slips can be fun or dull, well or poorly written. Which leads to the other question. Let us agree (since I try and write for those in the reality-based community) that the I Ching is utterly useless for fortune telling. You might as well flip a coin -- indeed, by the most common method, you basically are flipping a coin. But does that exhaust the book's value? If the I Ching is an ancient text that is used as a fortune-telling device, does that mean that it has no other uses? No other value or worth? I shall explore that latter question further in part two. Pluto, We Still Love You! "Pluto Demoted to 'Dwarf Planet'"
-- NY Times, August 24, 2006. Despite Christine Lavin's charming argument, Scott Westerfeld makes a depressingly good case that this was the right decision. (He'd better watch out for Cthulhu, though.) And Chris Clarke agrees with Scott. As do, now, Astronomers. David Neiwert is a journalist who has covered, among other topics, the far-right militia movement in the 1990's (the people who brought you the second worst terrorist attack in American history). For the last several years, he's been running a blog named Orcinus. One of his key topics has been the increasing rise of something he calls pseudo-fascism: something that is -- to be clear -- not yet fascism, but something that is also clearly on its way. He's written many posts about this, including ones which document the rise of what he terms "eliminationist" rhetoric -- and its increasing use on the mainstream right in this country. Neiwert's work is important because of its care and rigor as well as its forcefulness. Neiwert isn't just some grumpy lefty throwing around the term "fascism" -- indeed, he opposes such careless usage because it makes authentic fascism harder to see and warn about (for all the obvious boy-who-cried-wolf reasons). So he goes out of his way to note with care precise definitions of fascism from people like Robert Paxton, and to evaluate the ways in which the right wing in this country has and has not adopted fascist forms of rhetoric, thinking and action. Neiwert's work is a call to action. Fascism, he notes, is almost impossible to stop once it gains control of a country; so it is important to recognize fascist thinking as it develops. And on those grounds, we have a lot to worry about in this country. If you're worried about what the right has become in this country -- if you, too, wonder what happened to those boring-but-unthreatening Republicans you used to know -- you owe it to yourself, and your country,* to read this series. Neiwert has written a lot of important posts on this topic, but none has been more important than two of his multi-part series, "Rush, Newspeak and Fascism" and "The Rise of Pseudo Fascism" . My only hesitation in linking to it, honestly, is that they are well celebrated in the blogosphere, winning the left-blogosphere's highest award, the Koufax Award**, in 2003 and 2004, respectively. Heck, even I've linked to them before, in my own post on pseudo-fascism. But I think that a few people read my blog who don't read other blogs regularly -- and, hell, it's my award. So I hereby declare that the fourth official Attempts Best of the Blogosphere™ award goes, in a tie, to David Neiwert's two most important series. Indeed, so well-recognized are these series that you can actually read them in multiple formats and places. First, they are available as their original, plain-old blog posts. The first post of each is here: Rush, Newspeak and Fascism and The Rise of Pseudo Fascism; the last post of each (which contain handy links to the entire set) are here: Rush, and Pseudo Fascism. Second, each post has been reformatted as a pdfs, although for those downloading the pdfs, Neiwert requests a five dollar donation (information at his blog.) You can get the pdf versions here: Rush, Newspeak and Fascism and The Rise of Pseudo Fascism. Finally, for the first of these only (and the more complicated one, since it is in fifteen (!) parts instead of only (!!) seven), you can read it at Cursor, reformatted and with added art: Rush, Newspeak and Fascism -- that's probably the easiest way to read that first series. These are not only two of the best pieces the blogosphere has produced to date; they are two of the most important political essays for understanding the last decade. If you haven't read them, go read! And even if you have, read them again: they're worth rereading. And then, in whatever way seems best to you, join the struggle against the forces that, in Neiwert's words, "could very well devastate the world." * This is true even for any non-American readers, since your country -- whichever country it is -- would be terribly threatened if the pseudo-fascist right continues to metastasize in this country. ** Why "Koufax"? Because Sandy Koufax was one of the best left-handed pitchers of all time. We call upon the International community to join us in the boycott of Israeli film festivals, Israeli public venues, and Israeli institutions supported by the government, and to end all cooperation with these cultural and artistic institutions that to date have refused to take a stand against the Occupation, the root cause for this colonial conflict. I was going to dissent from this. But perhaps I should embrace it instead. Yes! Israel is doing evil things -- so let's boycott Israeli writers and artists! The U.S., of course, is brutally occupying Iraq. Are Iraqi lives worth less than Palestinian ones? Clearly not. So we have to boycott the U.S., too. This might be difficult for those of us who live in the U.S. -- we could go to no cultural events at all -- but morality is morality. But, of course, Britain is occupying Iraq too. So add it to the list. Then there's China. China has been brutally occupying Tibet for longer than Israel has been occupying Palestine. So obviously Chinese artists and writers are out. And many people say that India has no right to occupy Kashmir. Better to be on the safe side; so India's out, too. But why stop at occupying states? Surely states which do other evil or criminal things should be subject to boycott, too. For instance, countries such as Saudi Arabia and Iran brutally oppress women and gays, killing the former for crimes such as getting raped, and the latter for crimes such as existing at all. Those countries will have to be boycotted. For that matter, I just saw the other day that Iran's fatwa against Salman Rushdie is still in effect. Calling for the murder of writers -- can't have that. But oh, wait -- Rushdie is British. Or does he live in America now? Or should we consider him Indian? Doesn't matter: one way or another, we won't be reading The Satanic Verses any time soon. Fortunately, Iran's already on the list, so no worries there. It's getting to be a long list. People may worry that there will be no writers or artists left at all. But do not fear! There is an out! If institutions, or specific writers and artists, speak out against the occupation, they're exempt. (At least according to most versions of this idea.) So all we need to do is make sure that writers and artists speak out against the various atrocities in their countries -- but wait, isn't the whole idea here human solidarity? Better make that speak out against all the various atrocities. In fact, what if they miss one, or speak out in insufficiently outraged terms? To be on the safe side, we should prepare a statement for every artist and writer to sign. Hell, to read outloud: let them give their literal voices to the cause. In fact, isn't it wrong to speak of anything else while such cruelties go on? Perhaps artists and writers should be allowed to read only our prepared statement until the cruelties of the world are ended. The question of whether artists and writers are allowed to use personalized expressions in their readings, to highlight certain passages, is still in committee. Stay tuned. I know this sounds extreme. But oppression is oppression, after all. If we let artists and writers speak on whatever they choose, despite whatever evils they may be associated with, how can we ever be free? I know that so far this "best of the blogosphere" series has been "best of the funny blogosphere", and that this is, which makes three in a row, which by Talmudic principles means that they all will be -- but really, they won't, and I promise that the fourth entry in this series, whenever it happens, will be Something Serious. But in the meantime, I want to introduce you to Kung Fu Monkey. It's written by a stand-up comedian/physicist/screenwriter/comics writer named John Rogers, and he writes a lot about writing, which is smart but probably limited in its audience, and he rants about politics, in a way that is not only hilarious, but also (as the best comedy is (as KFM himself has pointed out)) smart, telling us things we need to hear. -- Of course the sub-text behind this is not only missing Republicans, but being frustrated as all ! @#$% with those Republicans who don't see what has become of their party. KFM's politics are not mine -- for one thing, he lists John McCain as one of his exceptions, which is clearly wrong. (I wonder if he'd say the same thing now?) And... well, other things, too. But that's not the point. The basic point, the key point -- that Republicans Are Missed, with the all-crucial implication that this is because They Aren't Here Any More -- is right. So it is well worth a read -- and, if you came across it before, it is well worth a reread; hence (for that is the key criteria) I hereby declare that the third official Attempts Best of the Blogosphere™ post is Kung Fu Monkey's I Miss Republicans. Go read it; you won't be sorry. And if you like it, there are a lot more where that comes from. Some I would recommend in particular are Lunch Discussions #145: The Crazification Factor; Bar Talk (previously linked in my Dershowitz round-up); and Learn To Say 'Ain't', but really, there are a lot of good ones. Still, I Miss Republicans is a great place to start. Check it out. Hooray for the Good People of Connecticut! Publius has the most interesting analysis I've seen so far. What should be the conventional wisdom -- I don't think it is, in TVland, but it is in the left blogosphere; and it's right -- is well summarized here (via). I think I have blogged more in the last six weeks or so than I have in any equivalent period. Wages of procrastination. I doubt I'll be able to keep it up -- so if I'm not putting up as much stuff in coming weeks, I haven't quit, I'm just easing off a bit. But it's been kinda fun. In any event, six weeks or so ago, on my one-year blogoversery, I made a collection of my more substantial posts from my first year. Early though it is, I thought I would do the same (more for my benefit than anything else) of my recent postings. As before, I will be organizing these by category. Perhaps I will note, for no particular reason, that most of these can also be read at my page at a site called Gather.com. Gretchen: No, that was a compliment. People Known as "The Great"
RIP. May they return, speedily, in our days. If any occur to you, please post additional fun Wikipedia lists in comments. Update: a few lists added. I'm gunning for a place on that last one. -- W. H. Auden, "September 1, 1939"
It's such a simple mistake that one wonders that people continue to make it. Fighting someone or something bad does not make those who oppose it good. One can oppose one side in a conflict without supporting the other side. Maybe people are going to deny this, I don't know. But it seems pretty bloody clear to me. It is a fundamental moral mistake of our times -- maybe of all times -- to think that because you look at a conflict and see that side A is doing something horrific, that must mean that side B is good -- not "defending against something bad at the moment, possibly even in partially illegitimate ways", but actually good. This is most often expressed by using the evil of side A as an argument that side B is not doing something wrong. - America's war against Vietnam was justified because the North Vietnamese government was despicable. - We should have cheered for North Vietnam to win because America was committing war crimes in Vietnam. 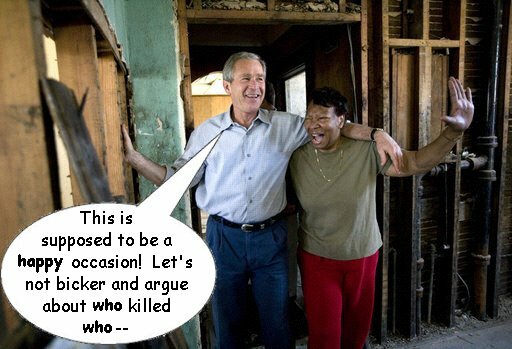 - Bush's attack on Iraq was justified because Saddam Hussein was an evil dictator. - The insurgents in Iraq are fighting for a good cause because the American occupation is wrong. - Israel's attack on Lebanon is justified because Hezbollah is an evil organization. - Hezbollah is a good organization because Israel's attack on Lebanon is brutal. I won't bother to give citations for most of these; these are paraphrases of common positions, and anyone should be able to find them with a little googling. (Hint on number four: don't only check American media sources.) But just as a sort of existence proof, let me give examples of the final two points. For an example of the first, you can read Martin Perez making a version of the penultimate point here ("any demo against Israel is a demo for Hezbollah"). I won't list more, as they are all over the U.S. media; go have a look. For examples of the second, read the signs of demonstrators in London making a version of the final point here ("we are all Hezbollah"), or check out what George Galloway said at the London demonstration ("I am here to glorify the Lebanese resistance, Hezbollah, and to glorify the resistance leader, Sheikh Hassan Nasrallah"). For that matter, at a New York demonstration, signs included "Allah (swt)* will destroy the terrorist state of Israel" and "Islam will dominate." Hezbollah is committing war crimes, firing rockets into cities at random. They are also led by Nasrallah, a man who has said "If they (Jews) all gather in Israel, it will save us the trouble of going after them worldwide.". Israel, on the other hand, is murdering huge number of civilians, and has lots of commentators calling for more blood than there is already. We don't need to support the other side to say that either is wrong. Now, my guess is that the first half of this simple truth -- fighting someone or something bad does not make those who oppose it good -- is actually less controversial than its corollary, that one can oppose one side in a conflict without supporting the other side. A lot of people who are willing to agree with the former will deny the latter. They will say that, yes, even if on some ultimate level both sides can have moral problems, ultimately we must pick a side, decide who we wish to win and who we wish to loose. This is how one gets silly statements like the idea that those who opposed the U.S. attack on Iraq were "objectively pro-Saddam" and similar slanders. But the second half is equally important, I think. To say that we must make a choice forces us to provide active support for evil, one way or another, in far too many situations. It's a terrible idea, and it needs to be opposed. Why is it not true? Because, very simply, it presents a false dichotomy that denies the possibility of other options -- and, even more destructively, can actually actively prevent the rise of other options. At the very least, it keeps us from being critically supportive of one side -- trying to change the behavior of whichever side we are supporting. But more often it simply blinds us to other alternatives, or even kills them before they can emerge. The U.S. blocked at various points other outcomes for the Vietnam war -- such as the creation of an independent, neutral South Vietnam with the NLF as part of the government -- because it wasn't sufficiently anti-communist: the U.S. wanted someone to fight the North, not simply not oppress the south. So evil governments were supported -- indeed, imposed -- to fight an evil government. There are ways to oppose Israel's actions besides supporting Hezbollah; there are ways to increase Israel's safety besides supporting Israel's attack on Hezbollah. Indeed, as many of these examples suggest, not only is this sort of dichotomous not necessary, it can be actively counterproductive. Israel is currently increasing support for Hezbollah in its attack; to say that one must support Israel's assault because Hezbollah is evil is simply self-defeating. On the flip side, Hezbollah's rocket attacks are increasing support in Israel for its assault; to say that one must support Hezbollah because Israel's assault is evil is likewise self-defeating. Now, this doesn't mean that we shouldn't say that, at any given moment in time, there might not be one side in a conflict that we have to support, despite evil on both sides. I don't think anyone of good will could help supporting the Soviet Union when it was invaded by Nazi Germany, despite the former's being one of the most viscous dictatorships of the Twentieth Century. But it is a serious mistake to leap to such conclusions; situations like this are extremely rare. Usually, there are other options. We must look long and hard for them before we decide that it's one side or the other. And, if we do, finally, decide that, at this point, it really is one side or the other, we need to constantly keep in mind that this does not mean the side we are supporting is good. Since one of the problems with not accepting the corollary that one can oppose one side in a conflict without supporting the other side is that a failure to do so can, over time, trick us into forgetting the central point, that fighting someone or something bad does not make those who oppose it good, by giving our support more and more strongly, more and more blindly, until we are supporting evil that is no longer necessary. After all, which side is right in a conflict in which both sides have plenty of wrong can change on a dime. A defender against aggression can keep going and fight its way into its own aggression. Indeed, we must be particularly wary of, and critical of, the side we support. "Now is not the time to criticize" is never true: we must always check our moral bearings. Anyone who responds to this essay by saying that, yes, but Israel/Hezbollah is the real problem here (because Israel's killing more people, because Hezbollah struck first, or whatever) has missed the point. And is, at the least, in danger of loosing their moral bearings -- fighting against evil in such a way that will corrupt you to become evil yourself. * In case you're curious, as I was, "swt" apparently is an abbreviation for an Arabic phrase meaning "Glorified and Exalted is He". * Hey, is "Saperstein" new? * Did you change the motto in your header? Do Libertarians Believe in Slavery?